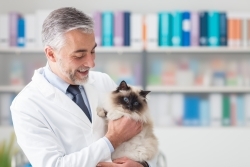 At Robert L. Gomez CPA, P.C., we offer intelligent accounting solutions for all types of veterinary practices. Equipped with an experienced team of accountants and a holistic approach, we’re ready to provide the accounting solutions and tax planning techniques that will save your practice money and increase profits. Find out how Robert L. Gomez CPA, P.C. can develop a package of accounting and bookkeeping services for your veterinary practice. Call us today at 919-678-8322 or request a consultation online.